Novices are often hampered by test-driven design's legacy terminology and notation. Behavior-driven development shifts the emphasis from testing to specification. Dan North describes how behavior-driven development makes established agile practices more accessible and effective for teams new to agile. The defensive programmer may sometimes feel a touch of paranoia in his work, but it’s all part of the job. Writing code today that is robust and defensive will help protect against the potential errors of the unforeseeable future. There are some large and complex tools out there for testers, but the ones Danny Faught uses most often are small and conveniently accessed by way of a simple, old-fashioned command line user interface. The middle of an emergency is no time to make a plan. Take a look at this installment of "Management Chronicles" to learn how not to be prepared for an emergency situation, and then read the Story Lines for some helpful, preparatory advice. Finding avoidable, show-stopping problems when performance testing late in a project is, unfortunately, not uncommon. 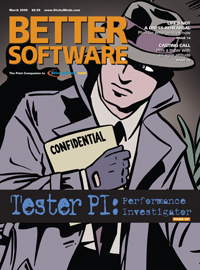 But Scott Barber says you can save time and money on your software development projects by investigating performance early and validating performance last. In this Test Connection, Michael Bolton discusses making your products portable.